Foliage: Leaves fold slightly when touched. 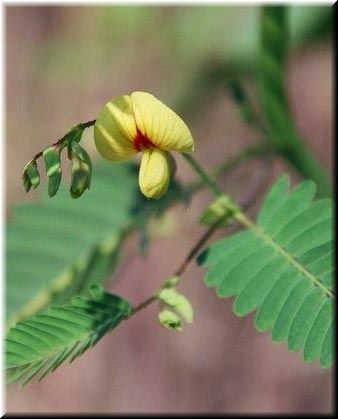 It has compound leaves that alternate along the stem, with each leaf consisting of 30-56 leaflets. Flowering time: Flowers late July into October. Fruit August & September, pods app. 3" long. Habitat: freshwater to slightly tidal marshes, prefering lower edge of intertidal marsh zone, receiving daily inundations. An obligate wetland species. Misc. 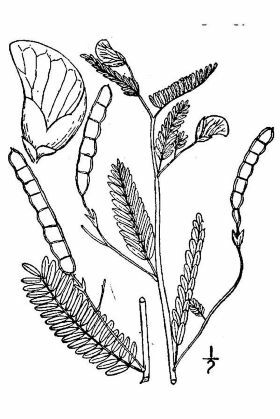 Sensitive joint-vetch gets it names from its leaves, which fold slightly when touched. It has compound leaves that alternate along the stem, with each leaf consisting of 30-56 leaflets. Historically, sensitive joint-vetch was known from New Jersey, Delaware, Pennsylvania, Maryland, Virginia, and North Carolina. It has been extirpated from Delaware and Pennsylvania; current North Carolina populations are small, unstable, and unprotected. 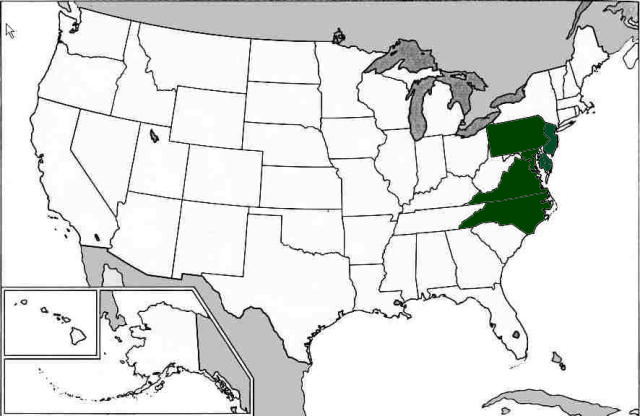 Populations still exist in Virginia and a single population is known to exist in New Jersey. Historical records for A. virginica occur in Atlantic, Burlington, Camden, Cape May, Cumberland, Gloucester, and Salem counties. "Aeschynomene virginica is native to freshwater tidal marshes of the mid-Atlantic states (USFWS 1992). These marshes exhibit twice-daily tides, but occur far enough upstream that they are nearly fresh or barely brackish in water chemistry. Salinity of one site in New Jersey ranges from 0.7 to 0.8 ppt with an average pH of 4.4. (NatureServe 2001). Only a small group of plants can tolerate this tidal inundation; thus, freshwater tidal marshes are home to many specialized and rare species. Aeschynomene virginica grows low in the intertidal zone where soils may be mucky, sandy, or gravelly (Department of Conservation and Recreation 1997). Aeschynomene virginica may perform best in areas of the marsh where competition with other plants is reduced -- for example, newly accreting shores or openings created by wrack deposition or muskrat activity (Department of Conservation and Recreation 1997). In North Carolina, A. virginica has been found in a few road-side ditches and wet corn fields, but these are not considered stable populations (Leonard 1985, USFWS 1992). Biological inventories of available freshwater tidal marsh habitat in North Carolina did not turn up additional populations, so the outlook for the taxon in that state is uncertain. Plant species commonly associated with A. virginica include: Zizania aquatica, Peltandra virginica, Pontederia cordata, Bidens laevis, Polygonum arifolium, P. sagittatum, and Leersia oryzoides, and, in southern areas, another similar legume, Chamaecrista fasciculata var. macrosperma (Department of Conservation and Recreation 1997, NatureServe 2001).Interestingly, Aeschynomene virginica has frequently been confused in the scientific literature with the invasive weed, Aeschynomene indica, and referred to erroneously as an agricultural pest! Recent genetic and taxonomic studies have resolved this confusion (Carulli and Fairbrothers 1988, Isley 1990). Insects are the primary pollinators: bumblebees (Bombus spp. ), leaf-cutter bees (family Megachilidae), and the least skipper (Ancylozypha numitor) have been observed on plants in New Jersey, according to Dr. Joeseph Patt of The Nature Conservancy. • Seeds are produced in pods, and segments of the pods can float and potentially disperse in water. However, seeds commonly fall very close to the parent plant (Griffith 2001). Seedlings may preferentially germinate in rafts of floating plant material that have been deposited on the river bank (Bruederle and Davison 1984). Such floating wrack may kill existing plants and open new bare space that can be colonized by A. virginica. Muskrats may also create such openings (Department of Conservation and Recreation 1997). As an opportunistic colonizer of bare space, an apparently poor competitor with other plants, and a plant that occurs in periodically disturbed, riparian sub-populations that may exchange propagules, A. virginica may exhibit metapopulation dynamics where it occurs (Griffith 2001). • Like its more common relatives, A. indica and A. americana (Grant 1996), Aeschynomene virginica may form nodules with symbiotic, nitrogen-fixing bacteria, but these dynamics have not been studied. If so, the species may be very sensitive to changes in the nitrogen content of wetland soils due to increasing nutrient inputs in water and rising atmospheric nitrogen deposition, problems that are especially severe in the mid-Atlantic region."